It was the last race of the AIA cross-country season at the State Championships and everyone was eager to watch the epic conclusion to see who would come out on top between two evenly matched teams. Over the second mile, the top of the field would change drastically with Lee Nasewytewa (Desert Vista, Sr.), Anekin Hetman (Brophy College Preparatory, Sr.), Leo Daschbach (Highland, Jr.), Sammy Van Alstine (Desert Vista, Jr.), Hunter Krasa (Mountain Ridge, Jr.) and Caden Resendez (Highland, Jr.) each jumping between ten and up to twenty places in the race. Meanwhile, the Highland Hawks had seized control with five guys among the top-ten of the field. 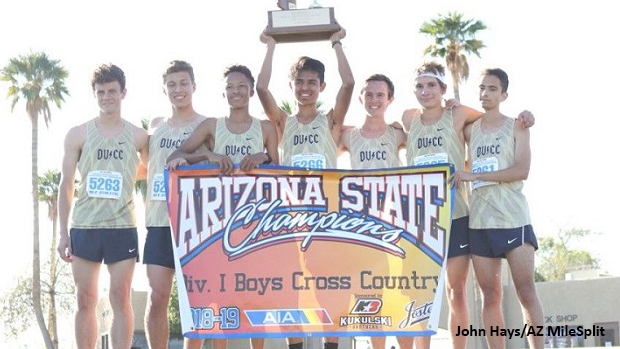 The last mile of the final race of the Arizona interscholastic season would completely subvert everyone's expectations. Daschbach had spent the majority of the season undefeated at home, and despite falling ill the week prior he was determined to run for his team and leave it all out on the course. At the finish line, spectators witnessed a single figure leading two others over the final hill and to the everyone's surprise it was neither Nasewytewa nor Daschbach at the front. Van Alstine had found the necessary gear to outrun his teammate and the returning State Champion and powered through the finish line in 16:03, with Daschbach taking runner-up in 16:07 and Nasewytewa another 2-seconds behind for third place. The Thunder placed four guys in the top seven and though the Hawks rallied to collect 41 points, it was not enough. As projected, it had been a fast and tight race, and in the end the Thunder had pulled off the victory over Highland for their fifth consecutive State Title and a large school record score of 31 points. Both teams had brought their A-Game and made the race one of the closest in State Championship history. When asked about his team's performance Coach Hanson said, "As far as I can tell, it didn't come down to anything I did or anything extraordinary they had, that Highland didn't. I only have three words and that's 'Glory to God.'"